Among the many anticipated events in the town known for its famous English style gardens, is the ‘April Bloom Best Garden Competition’, a colourful annual contest with a trophy coveted by the most famous and well kept gardens in the city. 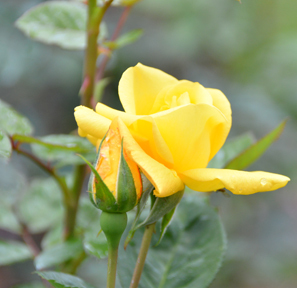 The competition is organised by the Municipal Council of Nuwara Eliya with the aim of encouraging the flower growers in the area. 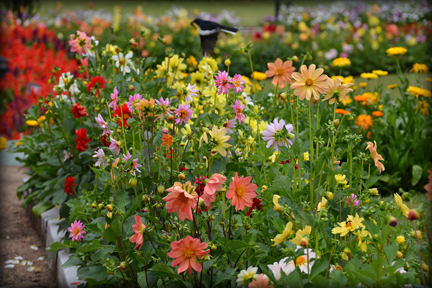 In April when the flowers go into bloom English Roses, Dahlia, Barberton, Gerberas, Lilies and Carnations are commonly seen in the lush gardens of every home in this hill town. Austin Wijethunge, coordinating officer and Officer in Charge of the Victoria Park, who has been working for the Nuwara Eliya Municipal Council for the past 30 years, say the garden competition started in 1938. “However, at first it was said to be a vegetable home garden competition,” he says. According to Wijethunge, the competition had been initiated as an ‘Agri Horticulture’ competition by the Wives of British planters during the Colonial era. During that period, the residents of Nuwara Eliya had had a home garden system where they grew their own vegetables, fruits and also flowers for their own needs. The completion had later been expanded to include both vegetables and flowers for the Department of Agriculture, when later became the organisers of the competing. “The vegetable show is not there anymore but the flower show has continued to this day in a grand fashion” says Wijethunge. Elaborating on how the garden competition had evolved through times, Wijethunge says the first venue was the present grand hotel premises, with the local authority being in charge of the competition. 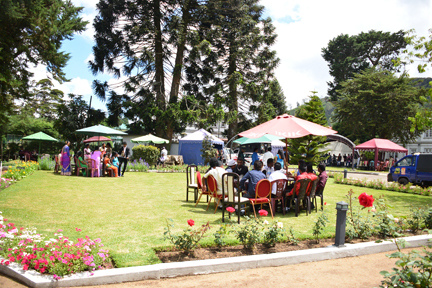 “The first flower show after the local authority took over, was held by the United Club, a club formed by the planters, which was later was converted to the Town Hall,” he says, explain that it was much later the venue was changed to the Nuwara Eliya Park. According to Wijethunge, though the original competitors had been the wives of British planters, locals had entered the scene after British left the country. Today any party can participate with the Grand Hotel, Hillcot Bungalow, Ceybank Rest, the Heritage Hotel being among the more famous competitors. Ceybank Rest, Nuwara Eliya, which has won the Best Garden competition many times, is fully prepared to take part in the completion this year as well. According to its Manager R.B Thilakaratne, Ceybank Rest has taken part in the competition for more than 20 years. “We prepare for the flower show from November and the planting happens from mid December to January. And then we maintain it till the competition commences,” he explains. An executive committee is appointed for the garden competition, which is responsible for the judges and all the other events related to the competition. 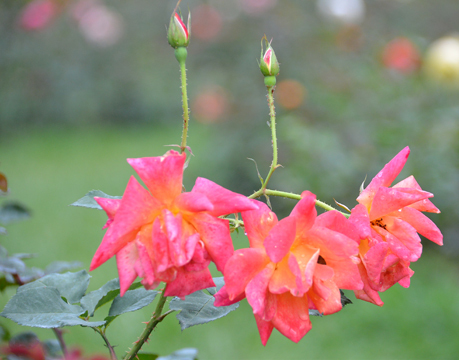 This year’s competition will include categories such as Best Collection of Roses, Best Rose Garden, Best Commercial Garden, Cut Flower Competition and many more. The fruit market in Nuwara Eliya is vibrant and colourful but also disappointingly banal. The shelves are artfully packed with imported apples and pears, oranges and grapes all buffed and polished and looking dewy fresh. The sight is nothing different to what you’d find in Colombo or anywhere else. 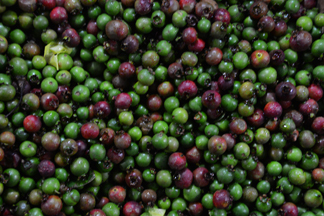 So where are the fruits Nuwara Eliya was once known for? Fruits like local apples and peaches and pears, even the sour guavas? Looking for them in the busy market place is a laborious task, but look hard enough and you do find them, but not in the quantity or even the quality you would have envisaged. Darshan Kumara of D.B Samson Silva stores, a store that solely sells fruits admits that most of the fruits they sell are imported, even though there is a high demand for locally grown fruits like pears and apples. While once apples grown in Ragala were available for sale, he says they never make it to the market anymore, as people do not grow them, as it is cheaper to import them other countries such as Pakistan and China. As for local pears, he says the local variety will be available in the market in mid-April and claims there isn’t a big market for the imported variety among locals or visitors. In the many fruit stalls in the market, there are strawberries, peaches, pears and guavas for those looking for locally grown fruits. Mohammed Shaffir who runs Shafir Fresh Food says that loquats, hill country grapes, sweet passion fruit and ‘seeni anoda’ are also among the very few fruits that they sell which are locally grown. Shaffir also points out that apples which are grown in Nuwara Eliya is much tastier than the imported ones, but that people have given up growing apples due to several reasons. “As only a very little quantity is produced, there isn’t enough quantity to be sold in the market. There was a good demand for locally grown apples however,” he admits. Senior Professor of Horticulture, Faculty of Agriculture and Plantation Management, Sumithra Jayasekara says fruit farmer have been mainly growing pears throughout the years in the hill country. Explaining the history of the many vanishing fruits of the region, he says farmers started cultivating potatoes in the Nuwara Eliya District, expanding to Badulla later on. He says as there were no land, especially to grow potatoes, the farmers not wanting to give up their vegetables plots converted lands in which they grew pears into potato fields. “It was economically more profitable for the farmers to grow potatoes and there was no problem with the market. Also it was easy to cultivate,” he clarifies, adding that unlike potatoes, it was difficult to store pears for a long period, resulting in rather high post harvest losses. This had led to the farmers gradually giving up cultivating pears and other fruits that once used to be a common site in the region. Professor Jayasekara says the Department of Agriculture had been introducing a variety of peaches from Japan to the farmers in the last 25 years, but claims farmers are reluctant to let go of cultivating potatoes because of the good income they get from the spuds. 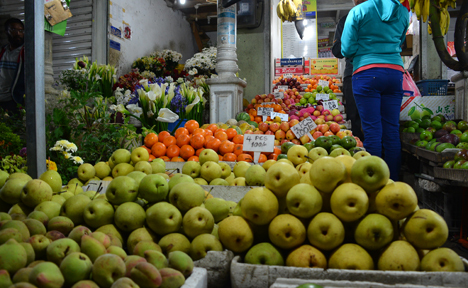 With locally grown up country fruits are becoming rare, perhaps a visit to the fruit market in Nuwara Eliya is a must these season to sample these fruits that may not be available in years to come. It is a place often overlooked in the list of places to visit when in Nuwara Eliya. Lost amidst the more famous tea gardens, parks, English style cottages, tea centres and markets, it however stands tall and proud, offering a panoramic view of Nuwara Eliya that none could compare. Identified as Shanthipura, this seemingly unobtrusive site is perhaps the best place to take in all that Nuwara Eliya has to offer. A short drive out of Nuwara Eliya on the Kandy Road, and a turn off near the Bambarakelle temple along the narrow Oliphant Estate Road takes visitors right up the mountains to Shanthipura, a village situated in the Kikiliyamana range of mountains. The village established by T. William Fernando, a former Member of Parliament representing Nuwara Eliya in the 1960s, is said located at the highest elevation in Sri Lanka lying at 1,868 metres above sea level. In 1980 R. Premadasa, the then Prime Minister provided better infrastructure facilities and renamed the locality Mudungala, today it is still better known as Shanthipura to the locals and visitors alike. A concrete road left off Oliphant Estate Road brings you to the viewing point in Kalapura, Shanthipura. A small building with a circular viewing deck at the top, it offers local visitors a bird’s eye view the surrounding area for mere price of Rs 20 per local and Rs 50 per foreigner. According to Ruwan Kumara, caretaker of the building, the site was opened in 1975 by former Prime Minister Sirimavo Bandaranaike. The air in Shanthipura even on a bright and sunny day feels much cooler than in the busy Nuwara Eliya town. The viewing deck, a short flight of stairs away, gives visitors a hawk’s eye view of the surrounding areas including of the Nuwara Eliya town below. On the right lies the Piduruthalagala Mountain range while in the horizon one can even catch a glimpse of the Hakgala Mountain. On a clear day, Ruwan Kumara says, visitors can see Adam’s Peak as well as the Namunukula Mountain range. He is also eager to point out the Moon plains along with several other interesting sites that can be viewed from the deck. 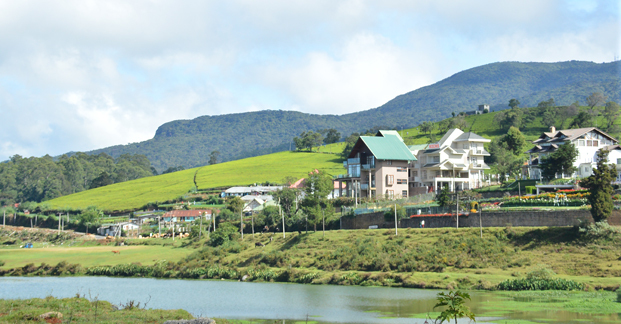 Spread below the viewing point is the Nuwara Eliya town in all its splendour. 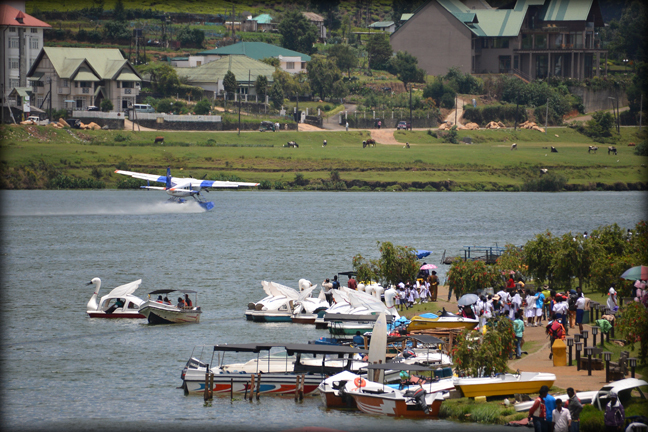 With a clear view from the top, guests can make out the boats being rowed on the shimmering Gregory Lake and the vehicles streaming through the Nuwara Eliya town, and of course its many cluttered buildings. Hard to ignore in the view of a tea factory, the village’s many vegetable gardens and lush tea estates. 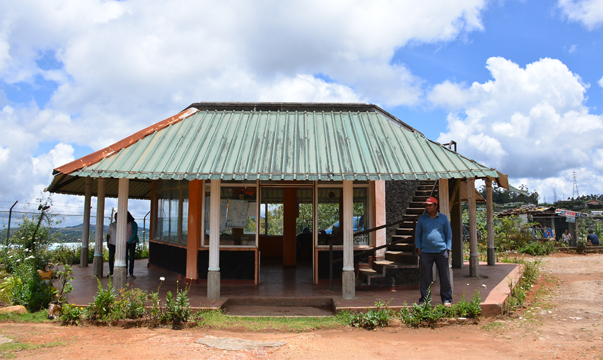 Pointing to a little lone green house on top of a hill, Kumara says it is the house that is located in the highest altitude in Sri Lanka. Glistening in the same direction, a bit far off from the viewing point, Kumar points to the Chethigiri Viharaya, the village temple. “It is the highest temple in Sri Lanka,” he says. Next to the viewing point is a small shop run by a local woman where visitors can warm themselves up with a hot cup of coffee or tea. According to Kumara around 2000 visitors arrive at Shanthipura annually, though a majority of the visitors to Nuwara Eliya do not know of its existence. With the drive to Shanthipura being hassle free it is surely worth a visit here for its amazing panoramic view of Nuwara Eliya and its surrounding areas. An icon that is pretty much a Nuwara Eliya identity is the historical Grand Hotel, the most luxurious and the most sought after accommodation option during the season and at all other times. A Landmark of the Nuwara Eliya town, the Colonial building and its well manicured English style lawns takes visitors to a bygone era of when Sri Lanka was Ceylon and Nuwara Eliya did truly look like little England. Built in the style of an Elizabethan era manor house in 1828, the Grand Hotel was once the palatial residence and holiday home of Sir Edward Barnes, the fifth Governor of Ceylon. Barnes after being appointed Governor had built the single storey bungalow at a cost of 8000 pounds, eventually naming it ‘Barnes Hall’. However, following the departure of the Governor in 1831, the bungalow was rented out to his successor, Sir Robert Wilmot – Horton, and was later purchased by Reginald Beauchamp Downhill, a well known planter and member of the Legislative Council of Ceylon. 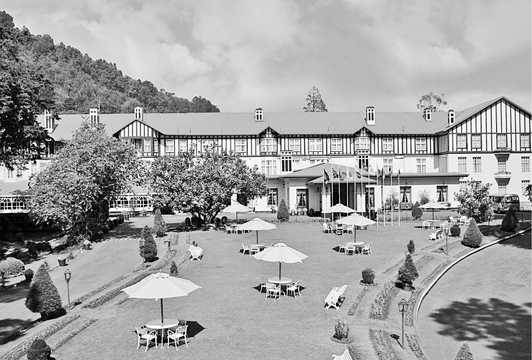 In 1892, it was sold to Nuwara Eliya Hotels (Pvt) Ltd. for Rs 35 000. Today, the Grand Hotel is run by the Tangerine Group. The present day Hotel, modernised to meet the modern man’s requirements, boasts of 154 rooms including six suites. A guide to Nuwara Eliya, which was published in 1893 by Capper & Sons, states that the price of a single bed at the Grand Hotel cost Rs 2.50 and Rs 4.00 for double room. The Guide also states a hot bath cost a guest 75 cents extra, while a cold bath could set one back by a mere 50 cents. Coach service to the Hotel and back from the railway station at Nanu Oya cost Rs 3 per guest. Expansion to the Hotel commenced in the 20th century, with the Northern wings being the first additions, which was linked through an archway to the main building. An extension was opened in 1904 and old photos show the second floor added to the Northern wings linked by corridor to the main building. A. Loesch, a former Hotel Manager from Hamburg was appointed as the Manager of the Hotel in 1904, which period also saw the Hotel expanding, with plans for 60 double and 40 single rooms. Given the landmark status it occupies, the Grand Hotel has had rich and famous guests, including members of royal families, prominent among them Lord Mountbatten, the Maharaja of Kapurthala Jagjit Singh, Sir Thomas Lipton, Leopold of Saxe-Coburg-Gotha and the Grand Duke of Saxe-Weimar, and Prince Reuss XXXII. Guest Relations Officer Shaam Weerasuriya says the hotel is still a favourite of many of travellers to the hill country. “Our hotel is popular, particularly among British and Arab visitors,” he says, adding that over 10,000 guests from Arab countries have visited the Hotel. “They always become returning clients,” he adds. Weerasuriya says the hotel still maintains its original sections, which were built over 200 years ago. “Due to good maintenance, these sections still look the same as they once did” he says, adding that Grand Hotel owns 17 acres of land including their own farms. The Hotel named as a ‘National Heritage Site’ by the Department of Archaeology in 1990, is not only of vast historical interest today but also offers a wide variety of outdoor activities such as bird watching, trekking, air rifle shooting, cycling, fishing, tea tours for it’s more adventurous and outdoor loving guests. According to Weerasuriya, the Hotel has programs to develop the community and also to provide employment opportunities for the people in the area. In a very sentimental gesture he says any guest visiting the Hotel can plant a magnolia tree in the premises as remembrance of their wonderful visit to The Grand Hotel. The good, the bad and the Ugh! What is the season actually like for its various residents? Anusha Gayan runs Hotel Anuhas located opposite the Police station in Nuwara Eliya. A small but very popular eatery, it has been in existence for the past four years and has been doing pretty well. Gayan is excited about the Spring Festival and is actually looking forward to it. “Our business goes up three times as much as on a normal day,” he says, explaining that in previous years the full month of April used to be considered as the season, but now they only see a surge in the crowds during the first two weeks of the month. However, he says the end of the season does not mean business is bad for them. His regular clientele and returning customers consist mainly of bank and government employees and the Police. They bring him good business keeping him busy throughout the year. Contrary to Gayan, Upul, a 44-year-old resident of Nuwara Eliya, who has been selling hats, jerseys and other cool weather items in the vicinity of Lake Gregory for the past 20 years, says the Spring Festival does not mark a large improvement in business. “Business is slow and I have not made even Rs. 100 today,” he says. He however admits that in preparation for the season he generally brings around 100 items whereas before and after April he only brought around 50 items for sale. But even so, he says business is tough, even during April and that he is compelled to approach crowds in buses and other public places to sell his wares in order to make a living. “I struggle to make a living. This is my livelihood and I do this business throughout the year” he says. While many vendors and business people look forward to the Spring Festival, D.R.P.D Rajapaksha, 26-year-old trishaw driver is perhaps one person who least looks forward to it. “I personally do not like the April season as it causes a lot of chaos and traffic in the city” he says, adding that this is bad for his business. “We waste a lot of fuel on the road to get to even small distances,” he says pointing out that crowds do not mean more business as they all visit the town in their own vehicles, so business for them sees no improvement during the time. In fact he finds the season hampers his livelihood. “I personally prefer the off season and wish people did not come here in such large numbers” he says, perhaps waiting for the season to be over so his life and business can get back to normal. Pony Handler Kumar too is not too enthusiastic about the Spring Festival. “For us there is no difference between the month of April and the other months of the year,” he says, explaining that business is slow throughout the year though they remain near the turf club seeking visitors. “People come for rides mostly on holidays,” he says claiming that business does pick up after April 15, but not significantly. Kumar believes the Spring Festival this is year is drawing a larger crowd because of the opening of the Royal Turf Club, but he is reluctant to say if this has made a change in the business. Kumar says even though it is difficult to get by with the earnings he makes, he won’t change anything because this has been his livelihood for many years.